If you’ve been around Something Swanky for very long, you may already know that I AM NOT a planner. Typically, I post quickie dessert recipes that I managed to make, photograph, edit, and post within a couple of hours (as opposed to many of my blogging friends who take the time to make a recipe one day, photograph it the next, then plan out their posting date a week or so in advance…). And it’s not that I’m proud of it, because I’d actually really like to be a great planner. I even buy these super cute Erin Condren planners every year, just to prove it. Sadly, it’s just not me. Not yet anyway. I’ll keep trying. Maybe one of these days, something will click! With the baby coming in just a few months, I’ve really, really been trying to get the blog ready for a little maternity leave. And it has been EXHAUSTING! I don’t know how you planner-ahead-ers do it. Even though it totally goes against my nature to thoughtfully plan out recipes and posts months in advanced, I have found a few little tricks here and there that have helped me stock up a bit without having to totally go out of my way. One of them (you may have noticed…. 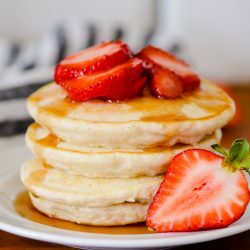 *cough*) is to post a lot of breakfast recipes. We like making fancy, dessert-y breakfasts around here. Most Saturday and Sunday mornings we make something extra sweet and yummy anyway, so I’ve just started to photograph everything we make! Air-go alllllllll the breakfast I’ve been posting these days. 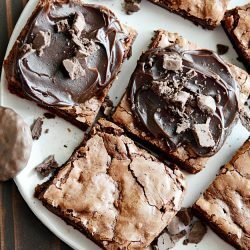 This recipe is so incredibly versatile, and I am in love! I actually managed to tweak these into THREE very different tasting desserts, just by making different fillings. I’ll be posting those over the next few months, so be sure to look out for them. But, for now, let’s talk about these. 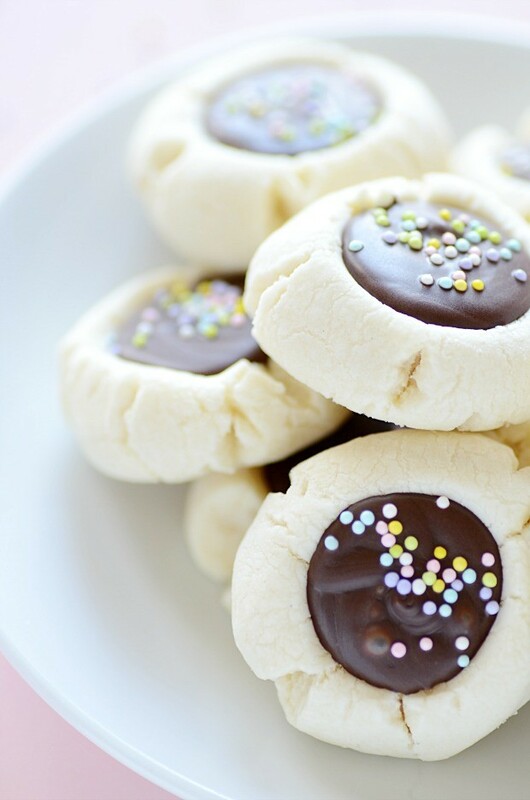 Crunchy, buttery, crumbly shortbread filled with chocolate. It’s a very, very simple treat, but simultaneously a little elegant, very cute, and absolutely delicious. And not to get too geeky here, but I also love the contrast of texture in these cookies. The soft, crumbly cookie next to the hard chocolate is REALLY good, one of my favorite textures to eat! 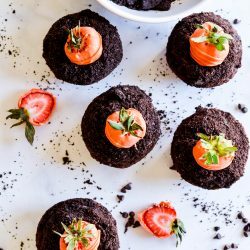 And of course, you can make these extra fancy (and seasonal) by topping them with sprinkles or candies. Seriously– SUCH a versatile recipe. It’s a great one to have on hand for entertaining, holiday get-togethers, and for gifting! 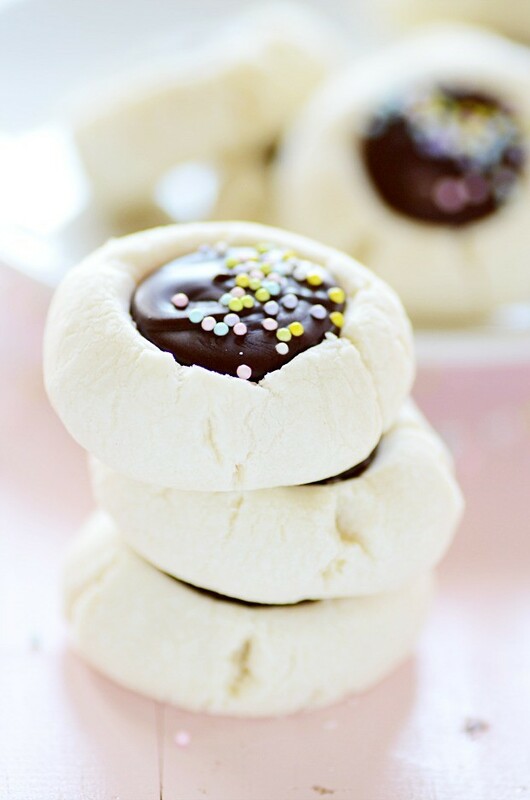 Crunchy, buttery, crumbly shortbread filled with chocolate. It's a very, very simple treat, but simultaneously a little elegant, very cute, and absolutely delicious. A great recipe to have on hand for entertaining, holiday get-togethers, and for gifting! Cream together the butter and powdered sugar until light and fluffy. Mix in the vanilla. In a separate bowl, whisk together the flour, cornstarch, and salt. Add the dry ingredients to the butter mixture and mix just until a dough comes together. Scoop and roll heaping tablespoons of dough. Place each ball onto a lined baking sheet. Use the back of a spoon or your thumb (I always use the back of a really rounded teaspoon) to create a small indentation into the top of the dough ball, making an effort not to crack the dough by pressing too hard. Bake for 10 minutes. Remove and press the indentation in again to make it a little deeper (still being careful not to crack the cookie). Let cookies cool completely. Meanwhile, melt the chocolate chips over medium-low heat on the stove*. Once melted, remove from heat and stir in the butter. Spoon chocolate into each of the indentations in the cookies. Let chocolate cool completely to harden before serving. *I frequently use the microwave to do this, but I'm not recommending that because my chocolate sometimes seizes when I use this method. Using the stove is the most fool-proof way to melt chocolate. Tip: instead of spooning chocolate into the cookies, try filling a piping bag with the melted (and somewhat cooled) chocolate. Snip off a tiny bit of the end, and use it to pipe chocolate into the cookies! I am a planner by nature. I just have to write things down so I can cross them off (I know I am weird!) However I can’t seem to get into the routine of making things in advance so I too am making the dish, taking pics and writing the post all in the same day and it is just exhausting!! BTW these cookies look super cute and delicious! The downside of planning is you have everything scheduled and then you find a recipe you mustmakethisminuteandpostnow. That messes everything up!! I love these, they’re PERFECT! I usually always make 3-4 different kinds of cookies when I make my cookie dough. I use whole wheat flour and oatmeal in my cookie dough then separate it and add orange zest, cranberries, coconut, pecans, walnuts, chocolate chips, or whatever. I can have a variety with one dough.I even roll them in fine coconut at times. Make them plain for the great grandbaby too. I love making them into balls and freezing them and having cookies whenever I want them. These look wonderful. My husband would love the chocolate, but I would love lemon. HA!! 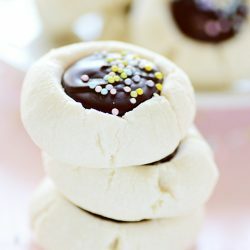 These cookies are so pretty! I love the chocolate centers! Good for you working on getting recipes ready for when you have your baby! It will be nice to have time off to spend with your new bundle of joy. It will be worth the stress now to have time off later! I am right there with you doing stuff last minute. I just can’t get ahead no matter how much I try…it just doesn’t feel right. Although I do make and photograph a few recipes each week. But I’m majorly impressed that you can make, photograph, edit, and post all in a few hours!!! 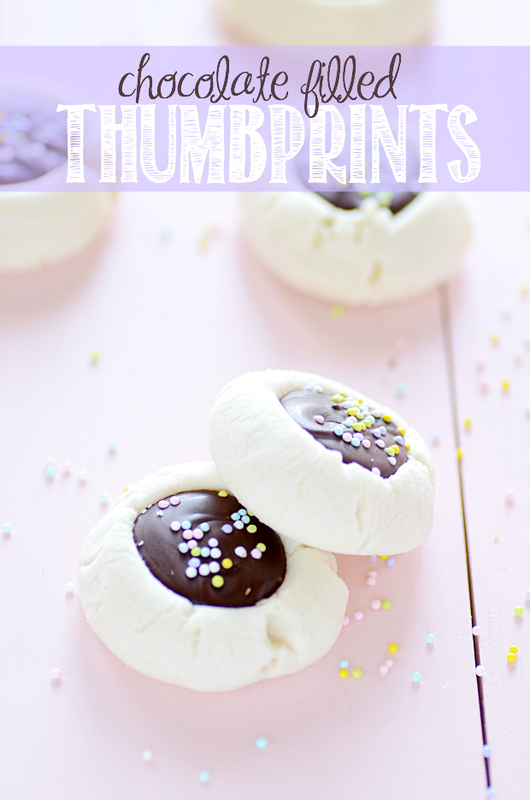 My scatterbrained mind can’t do that either ;-) I am loving these fun chocolate filled cookies. Those cookies are awesome for doing so much with!! !